Kirk: "But, please try to stay out of trouble, Mr. Spock." Spock: "That is always my intention, Captain." This episode has always been a favorite of Star Trek fans because it is one in which Spock is able to express his more human side. Leonard Nimoy's performance is the centerpiece, and certainly one of his best. His is the first character that experiences the bliss provided by parasitical spores infecting the inhabitants of the planet. There is great subtlety in the way Nimoy shows the human side of Spock. Jill Ireland plays his love interest Leila Kalomi, the colony's botanist, who had been in love with him when they studied together on Earth. Their scenes together have a lovely sweetness as the normally stoic Spock is able to explore feelings of happiness, wonder and love and she is able to feel the fulfillment of her own unrequited love for him. The Enterprise is on a mission to investigate the planet Omicron Ceti III where a band of humans had attempted to establish a colony despite the possibly deleterious effects of Berthold rays. In the intervening years, the rays have found to be fatal to humans, and it is assumed they will find only a dead colony when the Enterprise arrives at the planet. However, upon beaming down to the planet, this is found to be far from true; not only is the colony still alive but is apparently thriving. Using Spock's curiosity about how the group could have possibly survived in the face of the deadly bombardment from the B-rays, Leila lures him into the bucolic landscape. She exposes him to a flowering plant that showers him with spores. These are microscopic parasites that take over his mind and infuse him with good feeling and good health. This is the "paradise" alluded to in the title of the episode. The spores thrive on Berthold rays and their presence allows the exposed human host to survive the deadly bombardment. Spock's suppressed love for Leila emerges and the pair enjoys a playful romp through the hillsides, including one memorable scene of Spock identifying the shapes of clouds. Slowly but surely the spores take over the whole crew. Captain Kirk is finally infected with the spores, but realizes if he beams himself down to the planet, the crew will be marooned. It is Kirk's sense of duty, his loyalty to his crew and his love for the Enterprise that is basis for his character and the legacy of the entire Star Trek series. This is a fine example of the best of the original series. A strong script with many of the touches that add depth to the story, such as Bones reverting to his Georgia drawl and craving a mint julep under the influence of the spores. The acting is uniformly excellent as the lead actors have solidified their characters and are able to add nuances and layers to their performances. Although this is not one of the strongest Star Trek episodes, it definitely has great entertainment value and features several classic moments. The story maintains a reasonable suspense level and the conclusion is brought about with a nice combination of pathos and humor. There is great interaction between Kirk and Spock and the production design is very nice with some excellent interior sets for both the offices of the miners and the tunnels. This episode takes us to the planet Janus IV, where a creature has been killing workers at in pergium mine. The Enterprise is asked to intervene because it is imperative that they continue to meet their quota. As they begin to investigate, Spock takes an interest in what seem to be anomalous, spherical rocks that appear to be composed of silicon. Meanwhile, the creature steals a crucial pump from the nuclear reactor and time becomes essential as the reactor will soon go supercritical and explode. Kirk manages to severely wound the creature but it retreats back into the tunnels. Realizing that the creature is intelligent and a silicon-based life form, Spock postulates that this is possibly the last of its kind and suggests that they should not kill the creature on sight. Kirk, however, is adamant that no more humans be killed. It seems a bit inconsistant that Kirk comes off a little bloodthirsty, but there are times in the series that he overrides reason for the safety of his crew. There is great interplay between the main characters as they tackle the always thorny issue of what to do when encountering a new lifeform. 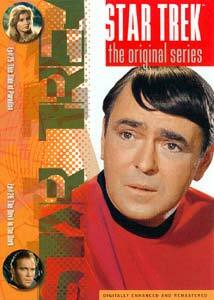 Spock and Kirk split up to cover a pair of tunnels and the creature causes a cave-in that blocks Kirk's retreat. Not exactly the height of Star Trek's special effects, the creature bears an uncanny resemblance to a man crawling under a pizza-splattered throw rug. Considering what Spock said, Kirk hesitates to shoot when the rug...er, creature makes no threatening moves, even as Spock now urges him to do it to save himself. This scene virtually saves this episode with this prime example of trust and loyalty between these two men. Nimoy's acting as he attempts to communciate with the creature is particularly good, making something difficult seem fairly believable. Despite the obvious artiface of the creature, there is much to enjoy in Devil in the Dark both as a Star Trek episode and as piece of science fiction. Image Transfer Review: Both episodes benefit greatly from the fine digital enhancement and remastering. There is a nice depth to the picture and fine color gradiations are revealed in some scenes that generate a new respect for the work of the original technical crew of the series. One of the great dividing lines between Star Trek and other television shows of the genre is the way that Star Trek looked. These discs allow fans who have seen the episodes many times to truly see them in a way that perhaps they have never seen them. The fine detail of the instrument boards is one example of elements that give the fan many occasions to go back over and look at scenes again and again. Often transfers of television shows look like...well, television shows. These Star Trek transfers set a standard. Audio Transfer Review: Neither of these episodes have soundtracks that take great advantage of the re-mixed digital audio. The mix is low and requires the volume to be turned up, but the dialogue is well rendered. The music, although a bit overdone—in the style of television of that era—is shown off to good advantage. The various themes that are played during certain types of action, for example, a joking sequence with its lighthearted jig or the mind meld with its electronic mysterioso backing, are shown off to great example and are just so essentially part of Star Trek. There are some good surround effects and a positive nod must go to the subtlety of the sound mix. Extras Review: The disc contains very nice subtitles, but there is a serious lack of extras here. This emerges as the main pet peeve of these discs, as there would seem to be a wealth of material that could enhance them. Most of the participants are still alive and new anecdotes, interviews, commentaries, notes of any kind would be welcome to the aficionado. With the data storage capabilities of DVD-ROM, it is easy enough to complain about the fact that there are only two episodes per disc, but to not even throw in a stills gallery or trivia facts or production notes or some small bone to the fans seems weak. If I could be assured that the cost and time necessary to achieve the tremendous video and sound quality precluded the inclusion of such extras, I could be somewhat mollified—so long as I am equally assured that this is not some cynical "holding back" of said extras to allow for a new, enhanced re-issue sometime in the future. Truly it is the episodes themselves that are most important and I am glad for these new versions, but it is the "extras" of Star Trek and its universe that make the series such an enduring social phenomenon. Both episodes are solid and, although neither soars to the heights that are associated with the best of Star Trek, are great fun. Each possesses those elements that make them enjoyable to watch. There is great humor and excitement in each and the writing, the acting, the special effects and the vision of the future that belonged to Gene Roddenberry are all exploited to great advantage. Perhaps not an "essential" disc in the series, certainly worthwhile for both devotees and casual fans of the genre.